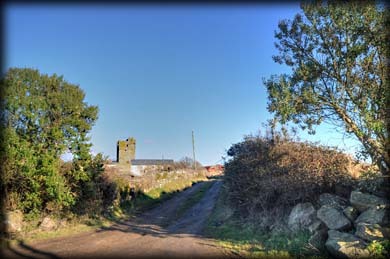 This 15th century tower house can be easily viewed from most of the surrounding townlands. It is located on very even ground a few miles north of Kilmore Quay. The castle is part of a working farm. I was hoping to meet the landowner/farmer as I approached the site, but unfortunately I could find no one to give me permission to wander around the tower house. The tower is situated at the southeast corner of a rectangular bawn. 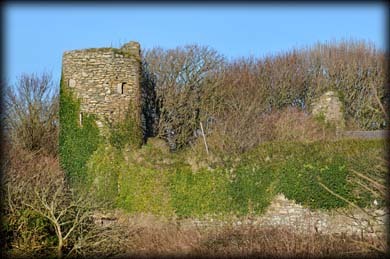 The image above shows the south wall with a machicolation to the left just above the gateway to the bawn. Pictured above is the west wall with the southwest corner of the bawn in the foreground. 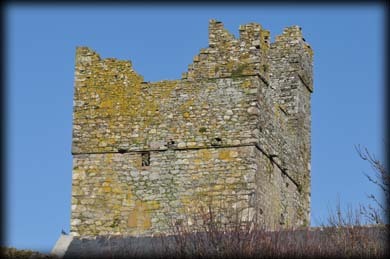 Below left you can see the four storey high circular tower that stands at the northwest corner of the bawn. Hopefully I will be able to get access to the bawn on my next visit. 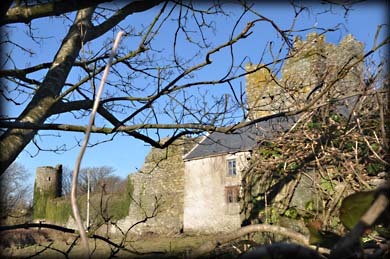 The castle was probably built by Robert Whitty to replace the castle burned by Art Mac Murrough Kavanagh at Ballyteige in 1408. There are historical references to the Whitty Family as vassals of the Marshalls dating to the early 13th century. These lands remained in the Whitty Family till around the middle of the 17th century when they were granted to the Colclough's of Tintern. John Colclough, one of the leaders of the Wexford insurgents in 1798 fled to the Saltee Islands before being captured an executed. His head is buried in St. Patrick's Cemetery, Wexford. His daughter later sold the castle to Edward Meadows before it passed to the present owners the Grant family. Situated: From Kilmore Quay head north signposted Wellington Bridge. You will see the tower house on your right, stop at the track leading to it, pictured right. Discovery Map 77: S 9663 0448. Last visit Feb 2015.